An average person deals with a multitude of competing demands each day in both their personal and professional life. These stressors combine to cause one to experience a myriad of physiological, psychological, and behavioral changes. The Thrive under Pressure program is designed to educate a person on the essential skills needed to deal with the competing forces in life. It teaches a person to understand the principles of managing stress and how to practice techniques that enable one to thrive in the face of intense pressure and adversity. This program promotes optimum performance and helps a person apply practical self-regulation skills designed to enhance their quality of life. Attention Control refers to the level of ability a person possesses to control their attention selectively on a task. A person’s ability to acquire and sustain appropriate “Focus and Concentration” levels is the underlying element for achieving peak performance in almost every field of work, athletics or aspect of life. When applying the ability to control and manage focus and concentration levels, almost anything is possible; without it, the simplest tasks become difficult. We all possess the skill to focus on something we choose to attend to, and this skill quickly responds with the proper training. The design of this program is to present the practical skills for controlling attention in order to achieve the focus and concentration that is essential for elite performances. Achieving excellence is not the result of one focusing solely on a desired goal. It is the result of relentlessly focusing on the priorities that support the desired outcome. In recent years, a number of psychological strategies have been identified as ways of achieving personal growth and peak performance. Goal Setting is one such technique. In fact, Goal Setting has not only been linked to influencing the performance of athletes of varied age and ability levels, but has also been linked to positive changes in such important psychological states as anxiety, confidence, and motivation. One can use Goal Setting techniques in all facets of your life. This workbook guides you as you reassess your current goals, and work to build the desire, determination and enthusiasm to achieve as part of the complete goal setting process. The Motivational Achievement Plan is a self-development tool created by APG to empower an individual to reach their true performance potential in all aspects of life. The MAP is much more than a Goal Setting program. It is a program designed to center focus, preserve energy, and reaffirm critical objectives daily amidst high levels of distraction, adversity, and wasteful practices. The MAP focuses on individual integrity, or the wholeness, of the person. Developmental areas include: intellectual development, professional development, physical development, spiritual development, ethical development, and social development. 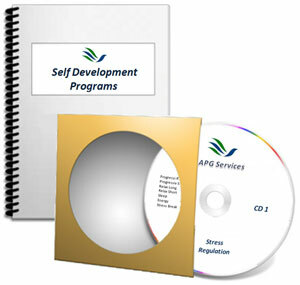 APG offers a self development Audio CD with 10 tracks designed to enable a person to regulate Stress & Energy in their daily lives. Each audio track is narrated to guild individuals through the process of progressive relaxation, manage stress, cultivate confidence, recover energy, and to enable a person to attain a sleep state as an alternative to medication. Soft soothing sounds compliment the narrator and together stimulate the body and mind to release certain hormones that enable the person to recover energy and manage stress in a natural way. Stress regulation training is most effective when accompanied with biofeedback training. For more information on where to find such devices or obtain personalized training in stress regulation, contact APG customer services.